When March comes around each year, it’s time for college basketball and Andrew Jackson’s birthday. Born March 15, 1767, Andrew Jackson grew up in rural poverty in the Carolinas. His parents were immigrants from Ireland, and both passed away by the time Jackson was a teenager. Despite growing up an orphan, Jackson eventually became a lawyer and a wealthy landowner. However, it was during the War of 1812 that he became a national hero as the general that defeated the British. In his time, he was one of the most famous people in America, and this propelled him to the presidency. But, how is Andrew Jackson remembered today? As time passes our assessment of a person may change, and evaluating Jackson remains difficult. Jackson’s actions cannot be ignored: his treatment of Native Americans, his ownership of other human beings, and his killing of another man in a duel. Jackson remains one of the most influential presidents. So, where does that leave Jackson when compared to other presidents? Let’s find out. Every March we watch as our students debate the best bracket picks for college basketball. 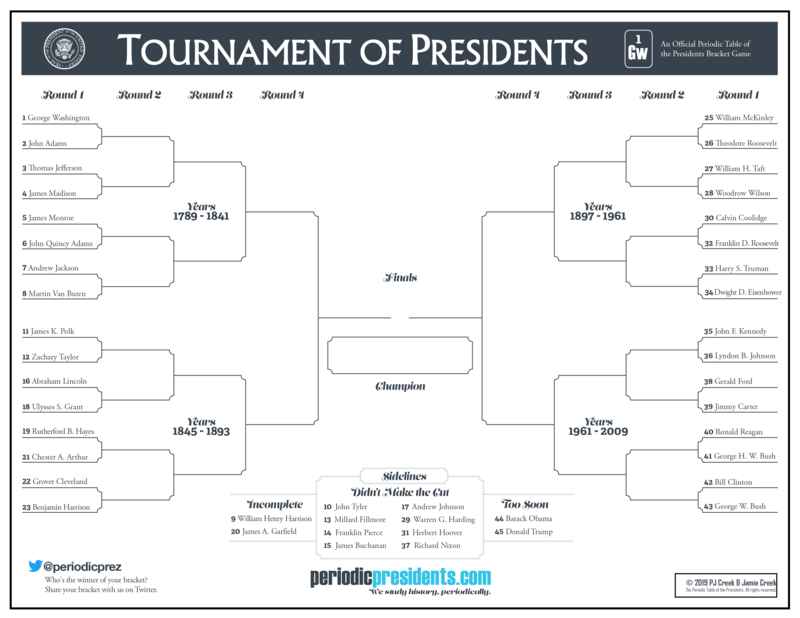 This March, we are asking our students to debate the best picks for our Tournament of Presidents. We’ve crunched the data and have made our selections. The Tournament of Presidents is a competition between 32 presidents. Some presidents remain on the sidelines, including those with incomplete terms and those too soon to tell. Some presidents didn’t make the cut, but we’ve created a bracket for them. We call it the Best of the Rest. How far will Jackson go in your bracket? Who will take the whole thing? And, who is your choice for the Best of the Rest? Share your brackets with us on Twitter @periodicprez. Check out cool shirts for your favorite president!